Washington, DC has the highest incarceration rate in the country. And this country has the highest incarceration rate in the world. More than 8,000 people go to prison or jail from DC each year, and each year more than 5,000 come back. Now, most of my friends are in the liberal arts, and so we’re all just a little suspicious of business schools. The dismal science of economics as a kind of worldly philosophy makes sense to us: the myths tell us that the ancient philosopher Thales fell into a well while staring at the sky, but his observations meant that he was also able to predict the weather and corner the market on olive oil presses. Business as a vocation (like law, medicine, the military, or the clergy) is a modern fact that confuses traditionalists and enrages critics of capitalism. Yet at its best, an entrepreneur is someone who looks around them and asks: what can I do to serve my fellow citizens? What can we do to improve the world? What should we do together? Many entrepreneurs do not start their own businesses: they work within existing institutions to change and improve them. Cultivating the entrepreneurial mindset is about helping participants see themselves as agents who can plan and co-create value with their customers, neighbors, and fellow citizens. Seeing oneself as efficacious and mutually responsible is thus an important element of entrepreneurship. If you’re a regular reader, you’ll recognize that what I described above is also the way that we in civic studies describe citizenship. 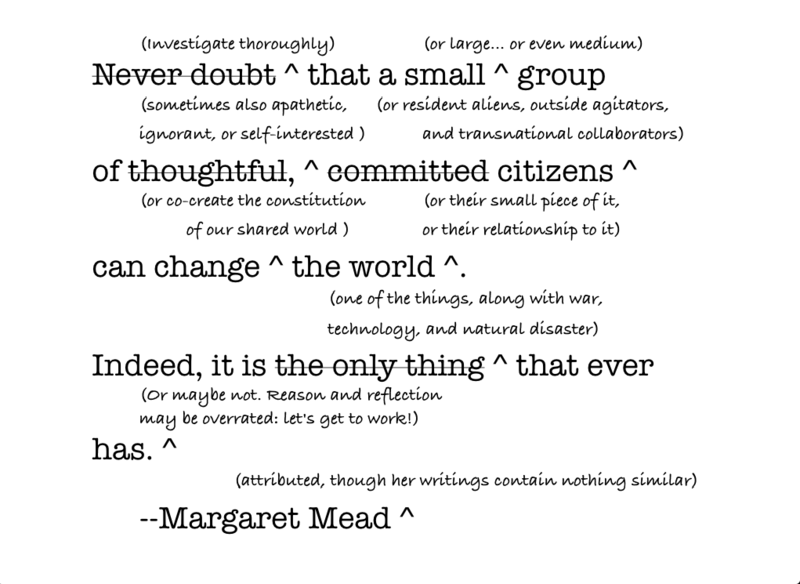 It’s an idea from Hannah Arendt, Elinor Ostrom, and Jane Mansbridge: to act as a co-creator of our shared world. I think, at its best, that entrepreneurship is a particular approach to citizenship, and not simply a matter of disrupting older industries in pursuit of profit. It’s about trying to find new ways of being of use to each other. And people with a history of incarceration are increasingly marginalized and rendered superfluous in our society–they need and deserve a way of being treated as dignified and valuable. It also disproportionately targets the poor: one study found that over the past thirty years, between 40 and 60 percent of prison inmates were below the federal poverty line at the time of their most recent arrest. More recent work suggests that incarcerated individuals have pre-incarcerated incomes 41% lower than their non-incarcerated peers. Raising returning citizens out of poverty is a moral obligation, if for no other reason than to prevent further crime and incarceration! Those least well-served by our District’s schools are also most likely to be incarcerated. Nationally formerly incarcerated people are twice as likely as the general public to have no high school credential at all, and more than six times more likely to have a GED. I think this means that incarceration is not (just) an individual failure, and we can be sure that its costs are not just born by the incarcerated. Children of the incarcerated are massively more likely to be incarcerated themselves, and neighborhoods with high rates of incarceration are made poorer by the loss of their neighbors. Each imprisoned man or woman has talents that are lost to their communities, and the stigma of a criminal record perpetuates that loss after their release. Sometimes the rhetoric of “human capital” hurts my heart. Prisoners and formerly imprisoned people are not just lost wages and unfounded startups: they’re our fellow citizens, our fellow human beings. They’re my friends and my students! But in a world dominated by profit, loss, growth, and stagnation it seems to work better to make the argument about “hidden gems in the rough.” That’s fine: if that’s what it takes to oppose mass incarceration today, that’s what we’ll do. But the United States has millions more people incarcerated than it ought to have–and we need to tackle that sooner rather than later. We know that the Pivot Fellows can be leaders. I’ve seen this firsthand with the Friend of a Friend Program and the Alternatives to Violence Project. Incarcerated and formerly incarcerated people who succeed in college courses develop the leadership skills that are useful both inside and outside the prison system. Imprisoned college students and graduates frequently become positive role models for younger prisoners, and have created service programs that focus on conflict resolution, youth development and other issues that are critical to personal transformation. Formerly incarcerated professionals like Dwayne Betts, Shon Hopwood, and Chris Wilson are both positive role models and reminders of that lost talent locked away in our nations’ prisons and jails. But these extraordinary men are not so unusual–there are tens of thousands more like them behind bars. I am certain that the Pivot Program will be the incubator for some who I will soon be glad to list alongside them. Georgetown is making great strides in its Jesuit commitments to “visit the prisoner.” We’ve developed credit-bearing courses at the DC Jail, and a Paralegal Studies Program for former jailhouse lawyers in partnership with the Mayor’s Office on Returning Citizens Affairs. I’m incredibly proud to work with the team at the Prisons and Justice Initiative and the McDonough School of Business. Baldwin was no fan of Elijah Muhammed’s movement, but he tries to understand it and he seems to sympathize. And what he calls out in these lines is an overriding sense of loss–one that can justify any effort or sacrifice to overcome. That loss of worth, which Baldwin wants to depict as something much deeper than “self-esteem,” is tied not to airy questions of recognition but to material harms and embodied injuries: frisks and kicks by “legitimate” authority that go unanswered, murdered fathers that go unmourned by white society. Baldwin even interprets the turn to Islam as a turn away from Christianity’s whiteness–from the forgiveness that it seems constantly to demand from white supremacy’s victims. Today I know more Black Muslims than Arab ones, but mostly they’re imprisoned. And that, too, is a form of superfluousness: of the 2.3 million people incarcerated in the US, 40% are Black, even though Blacks make up only 13% of the population. It’s hard not to see imprisonment of African-Americans as primarily a reaction to their enforced superfluousness. Labor market prejudices create a circumstance where unemployment rates for African-Americans are roughly double the rates for whites, at every education level. My students believe (and I agree) that the War on Drugs is largely a war on Black participation in the black labor market. (Recall the Ice Cream truck war of the summer which helps explain how police and the courts can make black markets less or more violent.) It’s an attempt to foreclose available forums for Black entrepreneurship. It’s notable that as marijuana legalization proceeds state-by-state it begins in white places, and the new profits and businesses are primarily white-owned. To be rendered superfluous is a particularly odd phenomenon, and at least in the formulation I’ve lately been thinking about, it seems uniquely tied to relative deprivations of status and respect. I want to believe that respect and recognition matter less than life or health. We all have things we could lose, and honor is the least of these. But that’s simply not how people act. Flourishing matters to most people more than survival, and flourishing requires a community of esteem. It requires reputation and character assessments, it requires that the agents of the state give you equal protection and don’t target you as a unique threat. How much should that matter? In my heart, I want to believe that people with a surplus of money, power, and respect should share. And I want to believe that it’s not a finite resource, that more souls can and will produce more of each if they’re not forced into superflousness. I think of Malcolm X, whose industriousness and self-invention could not be halted or stultified by racism or even Elijah Muhammed’s theocratic nonsense, only assassinated. But that’s where my analysis is probably wrong: when people have the money and power, they’re well-placed to demand the respect or punish its absence.